International criminal adjudication, together with the prosecution and appropriate punishment of offenders at a national level, remains the most effective means of enforcing International Humanitarian Law. 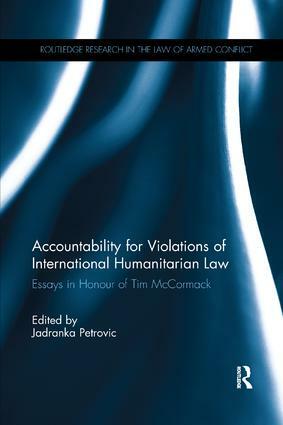 This book considers the various issues emanating from present-day breaches of norms of International Humanitarian Law (IHL) and the question of　how impunity for such breaches can be tackled. Honouring the work of Timothy McCormack, Professor of International Law at the University of Melbourne and a world renowned expert on IHL　and International Criminal Law, contributors of the book explore the interplay between the rules governing accountability for violations of IHL and other areas of law that impact the prosecution of war crimes, including international criminal law, human rights law, arms control law, constitutional law and national criminal law. In providing a contemporary consideration of the various issues emerging from present-day breaches of norms of IHL, especially in light of growing interest in ‘fragmentation’ and ‘normative pluralism’, this book will be of great use and interest to students and researchers in public international law, international law, and conflict studies. Moving from the mechanics of accountability to a culture of accountability: what more can be done in addition to prosecuting war crimes?